An unidentified object has been sending ripples through the stars. Armed with ever-developing technology in a massive galaxy, it's no surprise that we're always discovering new tales from the history of our little corner of the universe. With that in mind, here's one such story, as discovered recently by a group of scientists at the Fermi National Accelerator Laboratory (Fermilab) in Batavia, Illinois, who have just found evidence of what they say could be a massive collision that occured in our galaxy around 100 million years ago. The findings were published in Astrophysical Journal Letters. The astronomers in question say the evidence of this collision lies in the odd way stars are distributed north and south of the galaxy's midplane. The arrangement of stars in this area suggests to them that something seriously large or dense - a satellite galaxy, for instance, or a clump of dark matter - plowed through this region of space within the last 100 million years, leaving the perturbed stars as evidence of its passing. 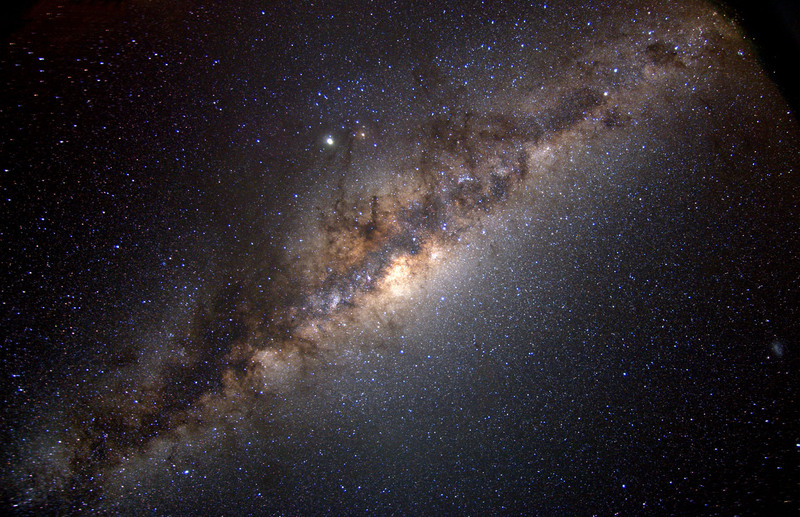 "Our part of the Milky Way is ringing like a bell," said Fermilab's Brian Yanny in a statement. "But we have not been able to identify the celestial object that passed through the Milky Way [and set this off]. It could have been one of the small satellite galaxies that move around the center of our galaxy, or an invisible structure such as a dark matter halo." "We clearly observe unexpected differences in the Milky Way's stellar distribution above and below the galaxy's midplane that have the appearance of a vertical wave - something that nobody has seen before," added Professor Larry Widrow of Queen's University in Canada, commenting on the findings. Adding to the confusion, Susan Gardner of the University of Kentucky isn't even sure this celestial incursion has stopped. "The perturbation need not have been a single isolated event in the past, and it may even be ongoing," she said. "Additional observations may well clarify its origin." It's hard not to wonder what this pushy celestial object will turn out to be; none of the options presented by the astronomers sound uninteresting. Normally I'd be the first to suggest aliens, but this seems a little heavy duty (unless we're talking Vogons, who seem like they could invest this kind of time in galactic rearrangement). But even if it turns out not to be aliens, freewheelin' clumps of dark matter in the midplane will do just fine.